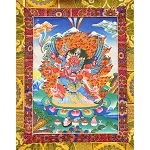 You must have received a Heruka Body Mandala initiation in order to perform this practice. The practice of Heruka Chakrasamvara belongs to the mother class of Highest Yoga Tantra and is one of the main practices within the Gelug tradition. The Yoga of the Three Purifications of Shri Chakrasamvara purifies the three doors of body, speech, and mind. Original translation by Ven. Thubten Tsapel (Hans van den Bogaert) with light editing by Ven. Constance Miller, March 2002. 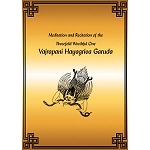 The text was edited and partially retranslated based on a comparison with several editions of the original Tibetan text of the Three Purifications by Joona Repo in March 2013.